Dr. Steven Roskos provides a loving touch to a baby born prematurely at Chogoria Hospital, Kenya. Though still fighting the lingering effects of jetlag, Dr. Steven Roskos jumped into action when Halima* arrived in the emergency room at Chogoria Hospital. Her blood pressure was high and her breathing was labored. She clutched her ribs as pain shot through her chest. And her kidneys were failing. Dr. Roskos, a short-term missionary, and Dr. Elijah Yulu, a Kenyan family medicine resident serving there, quickly hooked Halima up to heart and oxygen monitors. They prescribed the proper medications to help stabilize her condition. Roskos and Yulu spent a lot of time that day with Halima, who was only in her early 30s. When she reached out her hands, they clasped them. They prayed with her often, and they also called the hospital chaplain and evangelist to come speak to her the comforting words of the Gospel and the eternal hope that’s found in Jesus Christ. 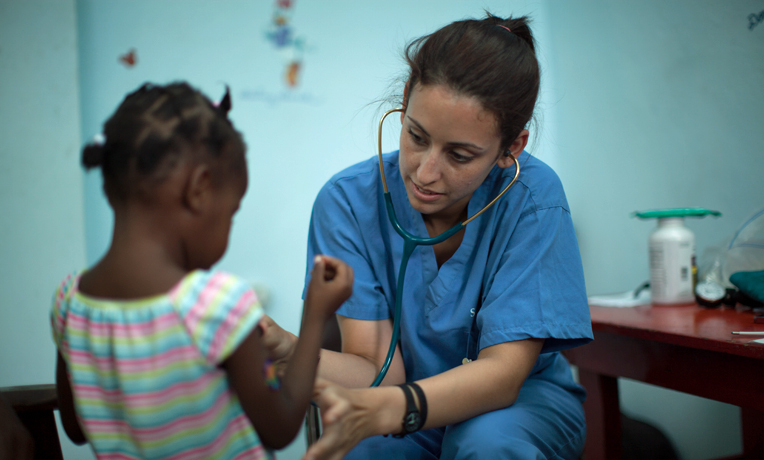 Dr. Roskos examines a young patient while serving at Chogoria Hospital. As the hours ticked by, Halima grew increasingly calmer. Roskos sensed she was more at peace. Halima’s condition did stabilize, and her family was able to transfer her to another hospital for dialysis. “I believe she experienced the love of Christ through us while she was there,” Roskos said. And that is what Chogoria Hospital is all about. Located 125 miles northeast of Nairobi on the eastern slopes of Mount Kenya, Chogoria Hospital was established in 1922 by a Scottish medical missionary. It’s the principal healthcare provider for more than 450,000 people. And it’s now a destination for missionary medical professionals and post-resident physicians serving with World Medical Mission. Reared in a Christian home, Roskos prayed to receive Christ as Savior at a young age. “But I didn’t have a personal relationship with Him until I was about 17,” he said. Dr. Roskos completes his rounds in the maternity ward with the assistance of the hospital’s medical staff. He met his wife Susan at Wheaton College, and they married during his third year of residency in Lancaster, Pennsylvania, in 1996. Their passion for missions dates back to trips they took in college, including to Africa. Early on they explored the possibility of long-term missionary service, but God guided them on a different path—fusing a ministry of compassion with a career in medicine. Initially that led the couple to the Appalachian heartland, where Roskos practiced seven years at a community health center in rural Tennessee. “We helped take care of underprivileged folks as a part of a group of Christians doing that together, seeing our work as ministry,” he said. The step Roskos then took—as God led—has shaped his career and outreach to this day, including his month-long volunteer service this summer at Chogoria Hospital. They made a small move to Knoxville, where he worked at the University of Tennessee. That calling then led the Roskos family to East Lansing, Michigan, in 2007. Roskos is an associate professor in Michigan State University’s department of family medicine. He has continued his commitment to missions by taking Christian residents and students on trips to Haiti and the Dominican Republic. He and his wife, Susan, are shown with children, from left, Anna, Sarah Grace, Hope, and Josiah. While checking out potential service options for this summer, Roskos contacted Bruce Dahlman, the department head of family medicine at Kabarak University in Kenya. He pointed Roskos to World Medical Mission and Chogoria Hospital. Their time of service became a family affair. While Steven stayed busy seeing patients from preemies to adults, Susan and the children—Sarah Grace, 17; Josiah, 13; and 12-year-old twins Anna and Hope—connected with kids in the pediatrics ward and at neighborhood schools and centers. In addition to handling his patient caseload, Steven invested time with Dr. Yulu and Dr. Boaz Niyinyumva, a resident from Burundi. Throughout his short-term service, Dr. Roskos invested time teaching residents, interns, and students. While most comfortable treating adults, Roskos enjoyed seeing younger patients. He especially remembers 14-year-old Fatima*. She struggled emotionally after being diagnosed with diabetes.